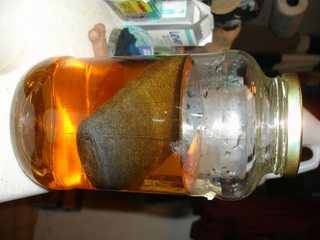 I made a solution of iron acetate by placing steel wool in one litre of acetic acid (vinegar $5\%$) and adding a few tablespoons of hydrogen peroxide of questionable age. 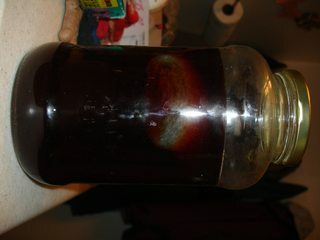 The solution turned a nice brown almost instantly upon shaking. 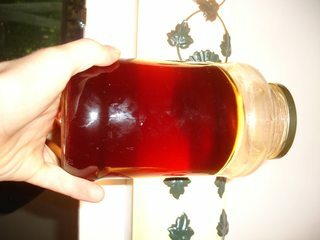 The result seems to be ferric acetate (III), since ferric acetate (II) is light brown in color (according to the Wikipedia link)--possibly like the light brown in the first/top photo. Ferric acetate (III) is supposed to be a red-brown color (again according to the Wikipedia link). It is the clear an colourless solution in the second picture that I am not certain as to its composition. Any assistance will be appreciated in identifying that solution. I would hypothesize that the white precipitate is either acetate or carbonate (more likely carbonate). I would guess that the clear solution occurred as a result of the solution interacting with either the steel wool or the air. I took the steel wool out after making the final dark red solution and it has been 2 days now without it diminishing in colour, so it is likely not the air that was interacting with the solution. Perhaps, if I placed the steel wool back in the solution, it might go clear again. I'll post again in a day or two. 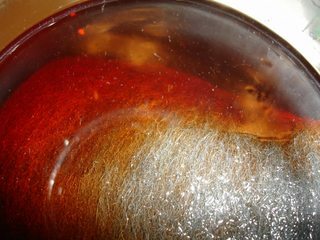 When you left steel wool in vinegar, iron reacted with acetic acid to produce ferrous acetate and HYDROGEN. The so produced NASCENT hydrogen is very strong reducing agent and it reduced the earlier formed brown ferric acetate (due to the presence of H2O2) ---> to ferrous acetate. This explains the loss of reddish brown colour. I don't believe you have any ferric in the colorless picture since you have a metallic iron which would reduce the ferric to a ferrous. I believe you have a ferrous (Iron(II)) acetate characterized as an off-white precipitant. Since your solution is acidic (from the acetic acid), you cannot have any carbonates; they react with the acid and carbon dioxide bubbles off. 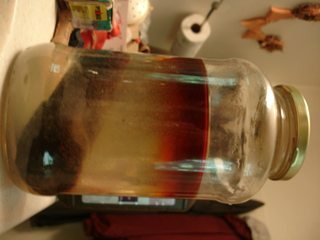 It appears that the brown solution is iron(III) acetate and the white precipitate is iron(II) acetate. 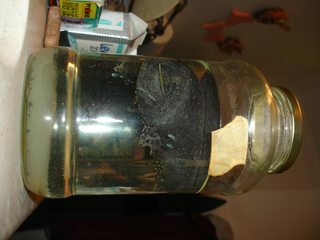 The darkness of the solution indicates the concentration of iron(III) acetate. I would like to add to the previous answers a Pourbaix Diagram, which demonstrates the transition mentioned between ferous and ferric ions as the electrochemical potential or redox properties of the solution change. Source This diagram suggests that the solution does indeed have a pH comparable to that of Vinegar which is pH=2.4 The H2O2 should not affect the pH, but rather the oxidation state (vertical axis below) from Fe+2 to Fe+3. What are the possible side reactions when preparing iron(III) naphthenate?